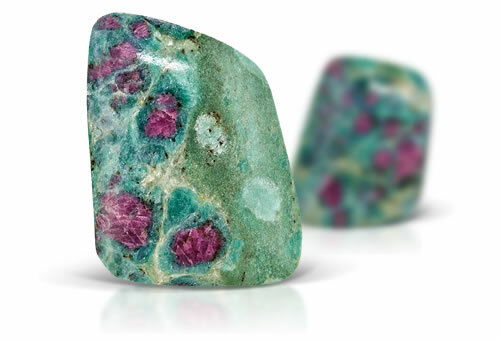 Ruby in zoisite is a translucent to opaque rock composed of ruby crystals, green zoisite and black hornblende. The official name for this gem is "anyolite," from the Masai word anyoli, meaning "green." This gem is usually used as an ornamental stone due to its stunning color contrasts. Some areas might have a 1.700 RI if tested in green zoisite matrix. Ruby areas might show hexagonal outline.